Star Wars Episode VII has finally landed in cinemas and what a frenzy of adoration it has generated. But here I would like to add my contrary opinion to the mix: I did not love it, nor did I hate it. I’m no stranger to Star Wars, having been a fan since 2001. But perhaps there lies part of the problem. I have had about 13 years of Star Wars Expanded Universe novel-reading before Disney acquired Star Wars and chose to blast away all the EU material and relegate them to nothingness. Sure, they have “Legends” status but that’s very little consolation. In the blink of an eye, characters I’d come to love (Jaina Solo! Jag Fel!) were just erased from canon. Sure, the EU had lots of weird stuff and some books were just not good, but some were amazing – primarily those by Timothy Zahn (Grand Admiral Thrawn is one of the most impressive and intimidating fictional villains across the board, I say), and the series revolving around the Yuuzhan Vong and the New Jedi Order was pretty impressive in construction. So to lose all those things, as well as the development of characters I already know and hold dear… Not fun. Anyway, on to the movie! It was rather nice to see Han and Chewie and Leia and Luke again. The dialogue is certainly much better written than it was in the prequels, and for the most part also had better delivery. The John Williams music. Mr. Williams cannot be beat, I tell you. I really enjoyed hearing all the old themes. The new ones mostly haven’t sunk in yet, but I found Rey’s to be very distinctive and quite nice. It had “magical” overtones, which worked strangely well in her first scene when she’s scavenging in the ruins of a star destroyer. Production design was overall good. I have no complaints. Very nostalgic and reminiscent of the original trilogy. 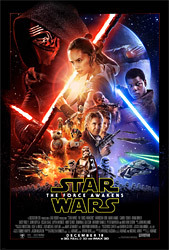 The primary negative aspect of it can be summed up in one line: It felt more like a remake of A New Hope (with some Empire Strikes Back thrown in) than a new, original Star Wars story. I feel this is rather a massive flaw. There were just too many similarities to the previous movies for me to give it high marks, even though it was a fairly fun movie. You see, I like epic world-building fantasies. That’s the thread that binds together Lord of the Rings, Star Wars and One Piece for me. They all exist in different spheres (one is “literature”, the other is “cinema” and the third is “comics”) but all three of them have immensely detailed worlds with lots of backstory. Star Wars was expanded through the novels and the prequels – the story and the world kept growing. With The Force Awakens, I don’t feel like the world “grew.” It just repeated itself. We hardly saw Luke (this in itself is a negative point to me), and from what we saw of Han and Leia, they hardly changed or developed. There were also so many parallels or analogous points between this movie and the old ones that it was just static in terms of world-building. One too many oddities that don’t really make sense or that go unexplained. Why is the Rebellion now the Resistance instead? In fact, why do they even still need to exist as a separate faction – why are they not not in the government? Why is the New Republic backing them? And if you’re being backed by the the ruling government, why still call yourself a “resistance”? Where in space did the First Order get the funds to construct Starkiller Base? Han Solo allowed the Millennium Falcon to be stolen. Really? Han Solo allowed his precious ship to be stolen? If Luke didn’t want to be found, why leave a map to his whereabouts in Artoo? If Luke didn’t make that map, who did? Why did Leia never really bother developing her Force skills? Surely she could at least have learnt to develop a stronger connection with her twin brother? Why did Artoo suddenly revive at the end of the movie?? Deus ex machina. Why does Kylo Ren even need to wear that helmet? The emotional punch of Han Solo being killed by his own son was lost on me. I felt sad, yes, but I was sad because it was Han Solo who died, not because it was his son who did him in. There were far too few scenes where the Solo family interacted with each other for me to feel the emotions I should have felt. Okay, with Han and Leia, I get it – they’ve been estranged so of course it’s awkward. But Kylo Ren/Ben virtually never talked about his parents. Snoke brought up the relationship, not Kylo Ren himself. All Ren does is “pray” to his long-dead grandfather. We’re never shown or told just why Han Solo represents a particular trial to Ren. A flashback to some childhood memory really would’ve helped. I can’t make up my mind about Adam Driver as Kylo Ren. When he took off his helmet and spoke, I thought his voice sounded odd. I’ve not seen him in other shows so I don’t know if he actually sounds like that. And I’m not intrigued enough to go find out if he does. Not enough Leia. I would have liked to see Leia actually do something. She seems to be leading the Resistance but we see her do very little actual leading. “Is there a garbage chute? Or a trash compactor?” – The best line in the whole movie. Han said it with such glee that I had to laugh. Plus, it was loaded with nostalgia and history but at the same time didn’t feel like a complete repeat. Actually, Han probably has all the best lines in the movie. I think this part of Kylo Ren’s exchange with Han would have had more impact if we didn’t know by then that he was Han’s son. But was there a way to get through the movie without having it revealed? Hmm. Force-sensitive orphan on a desert planet. Said orphan is also a great pilot and a mechanical whiz. Central trio of characters (though in this movie, Poe was apart from the other two for most of it and didn’t interact as much with them) – one who is Force-sensitive and a great pilot, another great pilot, one who is not a pilot but is pretty handy with a blaster. A Dark Lord-type who favours the colour black and bulky helmets. Cute droid companion who is also carrying Important Information. Wizened old short alien friend who doles out advice to the Force-sensitive orphan. Force-sensitive orphan chooses to ignore advice of short alien friend and of course, this doesn’t go well. There is a bar/cantina frequented by a variety of spacefaring types. Chisel-faced commander clearly holds Dark Lord-type in some disdain and dislike. Two of the main trio are captured by the Dark Lord-type at different points and tortured. The female one unexpectedly resists giving him the desired information under torture. The Dark Lord-type finds someone strong in the Force that he wants to train. Military regime has built a giant superweapon that can destroy planets. The good guys have their base on what looks like a forest planet. The good guys try to disable the giant superweapon by throwing several squadrons of X-wings at it. Someone important dies unexpectedly, at the hands of someone close to him. There’s an undercurrent of father/son issues. One of the central trio decides to abandon the cause, but then returns to help save the day. Han Solo is chased down by some shady characters because he owes money, and shady characters catch him but then get eaten by monsters.